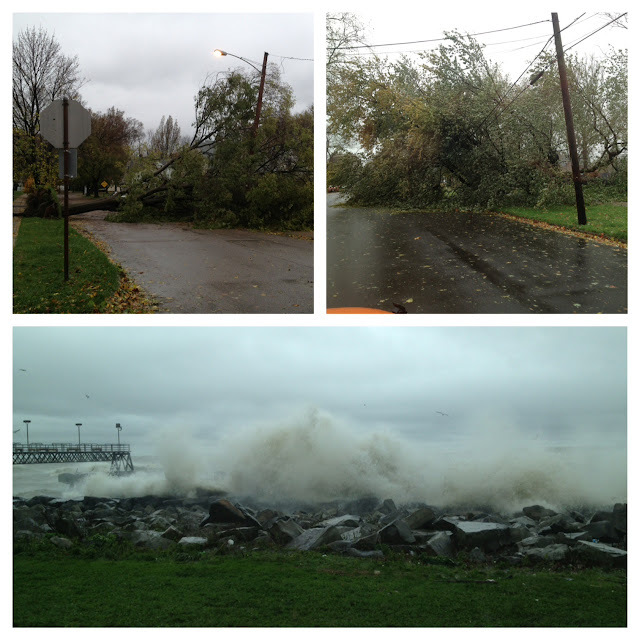 The first is a tree just a few houses down the block from us, the top right photo is two huge trees down in Lincoln Park in Tremont, and the bottom is a shot of the waves crashing in from Lake Erie taken at Edgewater Park on Tuesday. Imagine those waves x 3 the night before! I hope that everyone is staying safe and dry, and my thoughts go out to those that were really affected by Hurricane Sandy. From a Katrina to anyone named Sandy, the jokes will never stop. Trust me. Dante Boccuzzi's restaurant Dante in Tremont leaves me confused every time that I dine there. Our first visit, over a year and a half ago, we left feeling underwhelmed. We had tried the appetizer portion of the famous Linguine alla Carbonara with a poached egg and house made pancetta ($9). It was incredibly salty, and neither of us really enjoyed it. I have since had the same dish at his D.C. Pasta Co. restaurant, and it was not too salty. I think the dish can vary depending on the night. We also had the Hong Kong Style Mussels with chile peppers, cilantro, and crab meat ($12). That night, I declared them the "best mussels I've had in Cleveland". Then we moved on to the entrees. I had a gnocchi special with Ohio sweet corn and mushrooms that was simply divine. "R" had a beef dish that is no longer on the menu. It was served with a "potato donut" that was basically a fried potato patty, and a schmear of basil sauce on the bottom of the plate. The entire dish was dry and under seasoned, and "R" rarely complains about food. So, even though a couple of the dishes had been fantastic, we left there puzzled and not in a hurry to return. It took an entire year before we headed back there. We decided to start with a butter poached prawns appetizer, and an order of our beloved Hong Kong Mussels. The prawns were only okay (no longer on the menu), but the mussels were the real disappointment. They were small and overcooked, very unlike the plump mussels we received a year ago. The wonderful flavors of the broth were muted this time. Previously, we had been fighting to lick the bowl and now we couldn't be bothered to even dip our bread. What happened? For our main course, "R" ordered the curry duck (no longer on the menu) and it was delicious. The duck had a perfect sear on it while still moist, and the curry flavor was great. I was really in the mood for scallops that night, but my gut instinct was to not order the current preparation listed on the menu. I should have listened. The scallops were cooked to perfection, but the flavor combination in the dish just didn't work for me. They were served with small fried potato pancakes, strawberries, and a balsamic sauce. The potato pancakes crumbled when you tried to cut into them, so it became hard to get a good bite of it. Overall, the sweetness of the strawberries and bite of the balsamic just drowned the scallops, and the dish didn't work in my opinion. Again, we left having loved one dish, some were just average, and one was disappointing. When it's all over the map like that, it leaves me confused as to whether or not I truly enjoyed the meal. Finally, I attended a work dinner there last month where we were presented with a smaller version of the menu to select from. The duck that "R" had previously ordered was one of the main course options, so that's what I went with (it was great!). I had started with an order of the Crispy Calamari and Shrimp ($14) served with a chile spice mayonnaise. The dipping sauce was the only thing unique about this dish. Otherwise, it was your standard fried calamari and shrimp-- a little too heavy on the batter and kind of dry. However, the dinner ended on a high note. I selected the Artisan Selection of Cheeses from the dessert options. It was one of the best cheese plates that I've had (besides L'Albatros, but they are in their own category). I enjoyed all three cheeses, and the thinly-cut toasted walnut raisin bread that was served with it ($12). "R" and I even headed back there a few weeks later for an after-dinner cheese plate. So...can you see why I have mixed emotions about this restaurant? Or why it has taken me a year and a half to share my experiences there? Some dishes have been outstanding, some were good but forgettable, and a couple were terrible. Where is the consistency? Is it the fact that he changes the menu so frequently, that the kitchen can't perfect every dish? However, the renovated bank space is breathtaking. I'm also looking forward to trying his restaurant Ginko, which is housed below Dante. I've heard that it's the best sushi in Cleveland. A new pizza joint just opened up in Cleveland's Tremont neighborhood, but this isn't your average pizza place. Crust, opened by chef Jeff Fisher (Touch Supper Club fame) and partner Mike Griffin, is offering gourmet pizzas made with as many local goods as possible (often from the Tremont Farmers Market). They are also offering giant slices of pizza ($3) that are as big as your head. Other menu items are creative salads, pastas, and subs. All reasonably priced, in my opinion. "R" and I called ahead to place an order for takeout, and with just a 20 minute wait, we headed up there to get our food. We decided to share the Mixed Mushroom pizza with goat cheese, fresh thyme, fresh garlic, caramelized onions, balsamic reduction, white truffle oil, pecorino romano, and grated mozzarella. The specialty pizzas only come in one size-- large, 16 inch, 8 slices for $16.95. We had a choice between thin crust or hand-tossed, and we went with the hand-tossed. Doughy, but crispy-- it was pretty darn good. It held up well to the toppings and travel time. The pizza was packed with mushrooms, and had strong earthy flavor. We both commented that we wished the additional ingredients came through a bit more. Some balance in flavor was needed by adding more balsamic and garlic, and the pizza was missing the creaminess of the goat cheese. The goat cheese was minimal. Overall, we did really like it and I'd order it again. But you must love mushrooms. It was a carb-on-carb kind of night. We also shared an order of the Butternut Squash Gnocchi with slab bacon, fresh sage, caramelized onion, and finished with an apple cider reduction and pumpkin seed oil. For $9.95, it was a good sized portion and more than enough to share. It was rich and creamy, and had great fall flavor. The gnocchi were plump and doughy, and had started to soak in the tasty sauce. We know that it was prepared fresh, because the kitchen is open and as "R" stood at the takeout counter, he got to watch them make it right in front of him. We were stuffed, had plenty of leftovers for the next day, and were pretty pleased with the new find in Tremont. Welcome to the neighborhood! Just don't be looking for them to compete with Edison's late night pizza. They close at 7PM Monday - Thursday, and at 9PM on Friday and Saturday. Sundays they are closed. Also, with only a couple of high top tables by the counter-- make sure that you aren't necessarily planning on dining in. What a weekend! It was filled with friends, fun, and food. Friday night we spent a relaxing night in with my college friends and their husbands. Some Chinese food, wine, and playtime with my favorite baby was just what I needed. Saturday, it was time to hunt for a dress to wear to the West Side Market Gala coming up on November 3rd. A special night requires a special dress. Thanks to Dillard's and Jessica Simpson (I hate to admit that), I found a pretty silver dress that will do the trick. Saturday night was a very special birthday celebration for Joe G. and Justin at Hodge's in downtown Cleveland. The multi-course feast was called "Lambirthday", and you guessed it-- featured lamb in every course. We started out with a delicate dish from Melissa at Washington Place Bistro. And by the time the main course came out, we were surrounded by lamb and dining like cavemen. It was awesome. A delicious meal with good people. Happy 30th, guys! Sunday brought pumpkin carving for a good cause at Deagan's, and then a stop at Nano Brew on the way home. "R" ordered their new Pumpkin Ginger Bisque, and it was terrible. The soup was over-spiced, too heavy on black pepper, and the "soft" pretzel served with it was rock-hard and heavily salted. Luckily, the burgers were good again. "R" stuck with the Breakfast Burger (only one patty this time), and I tried the Foodie Burger of the day (daily special). Yesterday, it was with bleu cheese, bacon fig jam, arugula, and caramelized onions. Delicious! This weekend also included some beers. It is Beer Week in Cleveland, after all! What festivities are you participating in? We'll be at the Founder's Beer Dinner at Deagan's on Wednesday, and Brewzilla on Saturday. Happy Monday, folks! When it's Beer Week, Monday isn't quite so bad. These next two weeks are just nuts. I looked ahead in the calendar, and I was only home two nights out of two weeks. Some of it is work, some of it is play. But Tuesday was the only night this week that I didn't have something going on in the evening. Instead of heading to the grocery store, "R" and I decided to make a last minute Taco Tuesday excursion. This time...Lion on Lorain in West Park. Over the summer, a small group of us had breakfast there on a Sunday. It was memorable, and not in a good way. The brunch menu is 4-5 items, but most of us decided on a classic breakfast of eggs, potatoes, bacon, and toast. Our hearts were originally set on an omelet, but our server made a mistake by telling us that we could customize it. In fact, it is only served one way and most of us changed our minds after hearing what was in it that day. Anyhow....the breakfast food was fine, but nothing special. I did think that it was unusual that they serve honey spread right onto the toast without letting the customer know that this is how it is prepared. What if I don't like honey? It was delicious, but unusual, and I think it is worth servers noting. The scary part of the meal? The ketchup bottle! She brought it from the kitchen, and it had clearly sat too close to a heat source. It was so warped and discolored that no one was brave enough to use it. Don't worry folks, we snuck it into the trash can when she wasn't looking. It was repulsive. Why am I sharing this with you? Well, this experience was very disappointing and I wasn't in a hurry to head back. But, in the quest for Taco Tuesday-- I knew that I had to. I had heard really good things about their tacos. This week, they were offering 10 different kinds of tacos. Many sounded great, and we had a hard time selecting. I went with the Black and Bleu taco (ground beef, lettuce, mushrooms, onions topped with homemade bacon bits, crumbled bleu cheese, and Lion BBQ sauce) and the Puerto Rican taco (rice and beans with lettuce, Puerto Rican slow-cooked pulled pork, fresh mozzarella, and Lion hot BBQ sauce). The Black and Bleu (right) was probably my second favorite of all that we tried. It was a little heavy on the romaine lettuce, but after I pulled a bit out-- it was fine. The bacon bits were super crunchy, and added great texture. Something that would have taken this taco over the top would have been if the crumbled bleu had been warmed a bit to start melting into the taco. I would order this one again. The Puerto Rican taco (left) was disappointing. The pulled pork had barely been heated up, and cold pork is just tough and lacking flavor. Also, the rice was impossible to keep in the tortilla. My favorite taco that we tried was probably the Shepard's Pie taco with ground beef, lettuce, baked Shepard's Pie, and topped with mozz-prov cheese and BBQ sauce. It was so unusual, and brought me back to memories of eating my mom's homemade Shepard's Pie. Worth noting-- it was "R's" least favorite taco. To each their own. The tacos are $2 each, and come with a small side of chips and salsa. The are pretty good sized tacos for the price, and Lion on Lorain is certainly being creative with the toppings. Overall, they were good but not great. A step above your typical cheap tacos, but not quite in the same category as Deagan's or Touch Supper Club yet. From my personal Taco Tuesday adventures, I'd compare them to the tacos at Sachsenheim Hall in terms of quality. However, Lion on Lorain has much better, and more interesting, combinations going on. So far, I'd say that they are the winner in that category. I like how each taco has a name too. It was a fun Taco Tuesday night out, but it didn't necessarily leave me wanting more from Lion on Lorain. Have you dined there? What did you think? I'd like to go in for dinner sometime. They do a great job of promoting their specials online, and they often sound appealing. I think it's worth one more shot before I make up my mind. EDWINS Leadership and Restaurant Institute is gearing up to launch their unique non-profit concept in Cleveland, and last night brought us a fundraiser and official Launch Party in the eclectic home of Christopher G. Axelrod in the gorgeous condos at One Bratenhal Place. Over 100 guests wandered through the rooms, admiring Axelrod's collections and furniture, and sampling food from some of Cleveland's best chefs. Each room brought us new surprises, and plenty of food to try. ...a few speakers presented information about the Institute, and why they have gotten involved. "We have all made mistakes. Just some of us have gotten caught." So true. Everyone deserves a second chance, and that's just what EDWINS intends to do for its students as they provide housing, support services, and training for a career in the culinary industry. Learn more about the cause, the restaurant that will be open to the public, and how you can help at www.edwinsrestaurant.org. They are working hard to open their doors, and you can get in on the ground floor as they form and work towards changing lives in Cleveland. Look closely, it says "Accent" over and over again, illuminating by a deep passionate red. This is definitely the focal point in the room, and minimalistic furniture and decor don't take away from this work of art. Speaking of works of art...when the food started to arrive for the tasting, many compliments on presentation were handed out from the group. Red Snapper, cooked on the robata grill (special Japanese grill that cooks at 1,000 degrees). Some delicious raw fish and pickled vegetables. I actually liked the salmon! It was in a zesty orange sauce, and I went back for seconds. I typically hate salmon. The star of the evening-- Turkey Ribs. Actually, the bird's clavicle bone. I've never seen this done before, and it will be a signature dish (a whole turkey leg on their tapas menu too) at the restaurant. The restaurant will also be serving skewers of assorted meats and vegetables straight from the grill. The three sauces served with the ribs and skewers were outstanding. I couldn't pick a favorite between the chimichurri, teriyaki (reduced down to a thick, sweet glaze), or spicy barbecue. There were a few more dishes along the way, including SASA's signature French Fries, which made it over to this menu as well. But the evening ended with a sweet bite from the grill. S'mores! They were so smokey and sweet, and a perfect bite to end the meal. The Kims, restaurant staff, and executive chef Mike Lyons (formally of Chef's Garden) are excited to share their vision with the public. They officially open their doors on October 29th. Lyons "hopes that Cleveland is ready" for this unique concept. I think that we are. Diners can enjoy a more formal meal in the dining room, lined with custom booths, or a tapas-style menu in the more casual bar area. Two different concepts, two different menus. I look forward to a return visit once they open. It was time to tick another restaurant off the 2012 "To Dine" list. I'm really not doing that well, considering how quickly fall will fly by. It will be January before I know it, and time for a new list. I still have four left! It would have been five (ugh, half of the list), but Sullivan's closed its doors. I am destined to never complete my full list. But, you can help me finish off the last four. Who's in? Luckily, my good friend Michelle wanted to help and suggested meeting up for lunch yesterday at Tree Country Bistro in Coventry. I took a peek at the menu online, and was instantly overwhelmed. The restaurant offers a wide variety of Japanese, Korean, and Thai dishes, including all of your traditional curries, sushi, and so much more. How was I going to choose? I was in luck. For lunch, they offer a Japanese Box or a Thai Box. The Thai gave you the option of soup, salad, and then one selection from the list of curries, Pad Thai, fried rice, etc. ...salad, choice of sushi roll from a limited list, and your choice of fried rice or Pad Thai. It was a lot of food for just ten bucks. The soup was mild and forgettable, and the rice on my sushi roll was a bit overcooked and mushy. I forgave this, because I loved that the spicy tuna roll included whole tuna cuts, instead of minced fish, and the spicy mayo was drizzled on top. Overall, I did enjoy the meal despite a few small missteps. I haven't had a bento box in forever. Since the restaurant's menu was lengthy and intimidating for a first-time diner, this gave me a way to try multiple items for a low cost. Now, with Pacific East just down the street--I would never choose Tree Country Bistro for sushi alone. But, for someone looking for a diverse menu--this is the way to go in Coventry. Service was fine, parking was available in the metered parking garage just down the block, and we were in-and-out in one hour at prime lunch time. What's your favorite spot in Coventry? Yesterday's rain did not keep "R" and I from attending the West Side Market Street Fest and Parade in Ohio City. The free festival was open to the public, and despite the weather-- people were still out in droves to support the West Side Market's Centennial Celebrations. Spirits were high, and we still managed to make a good time of it. Bundled up in layers of clothing, and my fleece poncho (which basically felt as cozy as wrapping a blanket around myself)-- I was ready to hit the streets. The neighborhood's restaurants and vendors lined West 25th Street, and it was so easy to sample food and check everything out. We started with sharing a cheesesteak sandwich from Light Bistro, and a taco from Flying Fig. Then it was time to pop over to Lorain to watch the parade. I loved seeing the community organizations and West Side Market vendors march by proudly. The vendors received loud cheers from the crowd! Many of them have been housed in the market for decades. It was chilly yesterday, and the rain wasn't clearing up, so we ducked into Light Bistro for a bite to eat. I love their Brie and Apple sandwich on the lunch menu. A warm cup of coffee, and chocolate chip cookies right out of the oven hit the spot. Back out to the craziness of West 25th Street, we met up with friends at ABC the Tavern to watch the Browns lose (again). A little more perusing of the street vendors, and then a cocktail in Crop Bistro as we waited for a cab ended our Sunday out in Ohio City. We were cold, wet, and tired...but loving every minute of it. It was great seeing the market open on a Sunday, so many people out and about despite the weather, and the energy surrounding the Centennial Celebration. Now, I just can't wait for the People's Party and the Gala in November! Did you attend yesterday's Street Festival and Parade? When Brandon Chrostowski reached out to me to see if I would help him spread the word about his newest venture- EDWINS Leadership and Restaurant Institute, of course I said "Yes!" Brandon, the General Manager at Zack Bruell's L'Albatros, has helped make some nights really special for me at the restaurant. My last meal as I'm on my death bed? It would HAVE to include the cheese service from L'Albatros. I try to never miss their cheese dinner events, and many special occasions have been celebrated there. Brandon knows his stuff, and that is why I know without a doubt that this new concept will be successful in Cleveland. EDWINS will be a non-profit restaurant that is devoted to helping returning ex-offenders integrate back into our community, while teaching them invaluable skills and hands-on job training. It will provide culinary training, life-skills classes, housing, clothing, counseling, and other important support services. Their services will be provided at no charge to its students. The restaurant will be open to the public, just as any other restaurant would be. This is an exciting and innovative concept, and one that they hope will catch on. You can help! On Sunday, October 14th, EDWINS is hosting a fundraiser and launch party from 6-9PM. This event will feature chefs David and Karen Waltuck from New York's Chanterelle, Cleveland's own Karen Small from The Flying Fig, Zack Bruell of Parallax, Chris Hodgson of Hodge's, Paul Minnillo of Flour, and pastries from On The Rise. This great lineup of all-star chefs will create an unforgettable evening, and partner with potential EDWINS students to put out some great food to give us a taste of what's to come. Only a handful of tickets are still available. Individual tickets are $200, or a pair for $350. You can purchase online via PayPal. Your contribution helps to transform lives here in Cleveland! All revenue from this event will help start EDWINS restaurant and training programs. To RSVP or make a donation, email brandon@edwinsrestaurant.org, or call 216.744.2606. Disclosure: I was invited to attend the Launch Party, with a guest, in exchange for this post. However, I believe in this venture and would have shared this information with you regardless. The opinions stated are 100% my own. Yesterday, "R" was on a mission...a shopping mission. He does this about once a year. He dislikes shopping for clothes, so he's an all-or-nothing shopper. We'll hit several stores and stock up on pants, shirts, boxers, shoes, etc. and then he's set for a while. So, after dragging me around for five hours shopping at Aurora Farms Outlets and Beachwood Mall...I needed a beer. A quick stop at home, and then we decided to head to Nano Brew on West 25th Street in Ohio City. A new spot in the neighborhood-- we've stopped in briefly for drinks before, but we wanted to hang out in a relaxed atmosphere with a decent beer list and some available grub. Nano Brew fit what we were looking for. I am loving these fall-like days that we've been having. It put us in the mood for a pumpkin beer, and I've wanted to try the Hoppin' Frog ($15 for 22oz.). Nice flavor and smooth to sip on, it wasn't quite as good as ST's Pumpking but we both liked it a lot. "R" was still in the pumpkin mood, so he ordered the Pumpkin Kibbe- 4 for $4 (pumpkin dough stuffed with chorizo and cheddar and drizzled with cayenne honey and curried pumpkin seeds). They were okay. I'm not a fan of pumpkin-flavored foods, so I'm not qualified to really comment on this dish. However, "R" didn't love it either. We also decided to order some burgers later on. "R" went with the Breakfast (maple beef patty on an English Muffin with bacon, egg, and white American). He made the mistake of ordering a double ($12) with two 1/4 lb patties, and it was quite a mouthful. He said that he loved it overall, and would order it again as a single. After seeing a Foursquare tip, I wanted to try the Spicy burger (with caramelized onions, sauteed sweet peppers, and white American). The single was $7, and all burgers come with waffle fries. Yum, waffle fries are awesome! The burger was topped with too many roasted red peppers for my personal taste, but the heat level was nice and subtle and I did like it for the most part. I'd probably try another burger next time though. All of their burgers are cooked on the flat top grill, and are cooked all the way through. Worth noting. So, I'm not even going to comment on the debate about whether or not Nano Brew is a "real" brewery, or if they post about bicycles too much on their Facebook page. 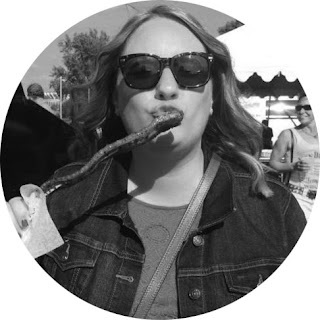 I enjoy the casual atmosphere, I think that they have a decent beer list for Ohio City, and we enjoyed the food for a quick bar bite at a reasonable price (Dining Deals Alert!). We'll be back, and I'm personally happy to see something like this take over the Garage Bar space.